Here's just a small sampling of hand-made crafts that we've helped you build over the years. A Guillemot designed 'Night Heron' strip planked kayak. This one still in 2 halves. 18' with a 20" beam and weighing approximately 20kg, lightweight and stylish. The third skiff for Franklin, this one built at the WBC in early 2016. A community rowing boat used for fun and fitness as part of the international St Ayles Skiff Regatta circuit. A version of the popular and versatile canoe our Western Red Cedar strip planked canoe is built in 4 weeks. Painted on the outside with a bright finish inside to enjoy the beauty of the timber. 14' long and only 14kg this sea going kayak is a modern take on a traditional Inuit design. 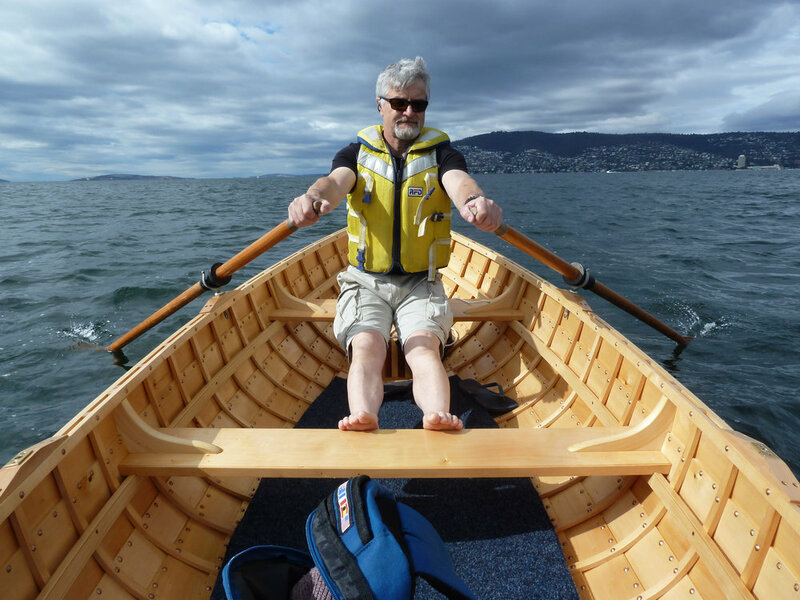 Built in only 5.5 days, finishing with a paddle on the Huon River. This course is run by Peter Ingram-Jones and Greg Simson twice a year. A 27' Whaler, number 536 built in Brisbane in 1953. This vessel now back in active use by the Franklin community under the custodianship of the Living Boat Trust. Originally planked in Kauri, but restored with Huon Pine planking. Still our most popular short course. This 11'5" dinghy can be built as a rowing only or rowing and sailing dinghy as part of an 8 week course. Designed by Adrian Dean and inspired by Percy Coverdale, a classic example of Tasmanian heritage craft. 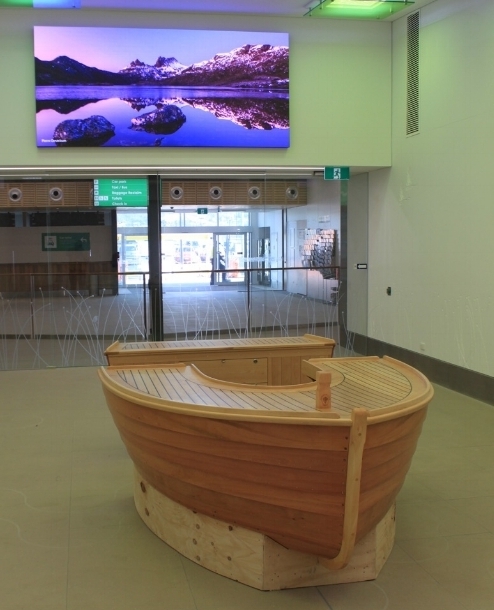 This counter was commissioned by Misho and Associates, the architects overseeing the Hobart Airport upgrade. Planked in King Billy Pine with a Celery Top Pine laid deck, this counter makes a stylish statement about Tasmania's craft, special timbers and island status. Strip planked in Huon Pine with a Cedar deck from the owners property in Northern NSW. This boat was built to house a 1915 5hp Frisco diesel engine. Launched in 2016. 1930 Chris Craft custom barrel back design. King Billy Pine/ 3mm ply. Cold moulded over sawn frames. Motor, Yasa 400 Lithium Iron Phosphate Battery celles. Lady Franklin is a 30ft traditional sloop designed by Cox. This was the first boat built by this school using a sponsor to commission a boat in order to train a crop of boatbuilders over a two-year diploma course. Lady Franklin was launched in 1996. Atlas was designed by Jim Brooke-Jones, a student in our first course back in 1994. Jim stayed on having designed this boat as a part of his course he commissioned it as the sponsor for the following course, and when complete he sailed back home to England with his family via the Pacific. Wild Honey is a 32 ft Llyle Hess design crafted from Huon Pine. Built by students at the WBC Tasmania, it was launched in 2000. Wild Honey is located in Kettering south of Hobart. Ubique (from ubiquitous/everywhere) is a Llyle Hess design of 32ft. Built of Huon Pine by students of this school and launched in 2002, it now sailing out of Kettering in Tasmania. Belle is a labour of love for both those who built her and for her current owner Tetsuya Wakuda who is one of Australia's most well-respected chefs. 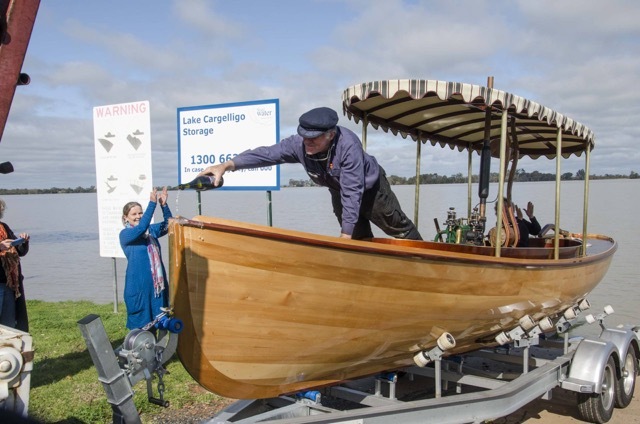 Launched in 2011, the 11-metre cruiser is a celebration of Tasmanian timbers, with a Celery Top Pine keel and a Huon Pine lined saloon.